Step into peaceful settings at Madison Marriott West. Our upscale hotel takes the hassle out of travel by providing a complimentary shuttle to and from Dane County Regional Airport. Easily access local destinations such as Greenway Station shopping mall, the University of Wisconsin-Madison, Middleton High School and Capital Brewery. Following your eventful outing, rest in our spacious rooms and suites. Our complimentary Wi-Fi, plush bedding and flat-panel TVs will make you feel at ease. Take advantage of our convenient room service or satisfy your appetite at our on-site restaurant. Falling Water Bar & Grill serves delectable American cuisine as well as a wide range of drinks. 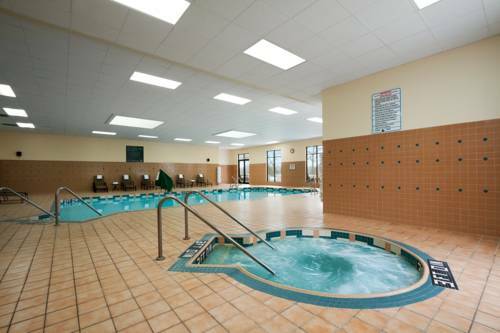 During downtime, get in your rejuvenating workout at our indoor pool and 24-hour fitness center. Need to host an event? We have you covered with 15 customizable venues, catering options and rentable AV equipment. Whether you're in search of a laid-back getaway or work travels, indulge in a relaxing stay at Madison Marriott West. Falling Water Bar & Grill: Satisfy your hunger for scrumptious cuisine at our on-site restaurant. Enjoy our large selection of fresh salads, tasty sandwiches and juicy steaks. Pair your meal with one of our handcrafted cocktails as you take in our welcoming atmosphere. Falling Water Lounge: Power-up at our lounge amidst your travels in Middleton, Wisconsin. We offer a variety of healthy and hearty options for your laid back yet elegant dining experience.